In response to an invitation exhibition at Spokane Art School, a piece inspired by the Jack Kerouac novel, "On the Road" was created. The center is an ornamented speedometer housing from a rusted hulk of a 1940s sedan found where the town of Conata, South Dakota, once was. The back piece is a repainted stop sign from the boneyard at the Moscow Traffic Department in Moscow Idaho. 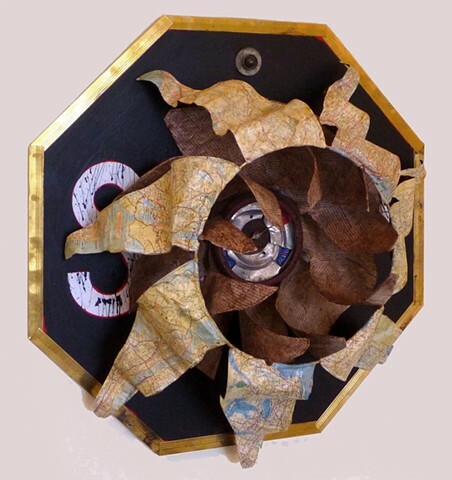 The pennant-like shapes are made from old US maps and used coffee filters.